Columbus Day is celebrated on October 12. In school, kids study the voyages and exploration of Christopher Columbus. But you can study American history on any U.S. holiday--Memorial Day, Veterans Day, Memorial Day, Flag Day, 4th of July or Labor day. Re-discover American history--or discover it anew if you've never paid attention before. The best place to start is at the beginning, which usually assumed to be with the discovery of the "New World" by Christopher Columbus. The land now called "America" didn't start when the Italian navigator Christopher Columbus stumbled upon it. Christopher Columbus wasn't even the first European to find it and he certainly wasn't the first world traveler to. St. Brendan and the Vikings beat him to it. Christopher Columbus is credited with discovery of the New World because he brought attention to it as no one had before. Here are free printable Christopher Columbus lessons on world explorers, colonial expansion, early mapmaking and navigation. Garden of Praise says that Christopher Columbus was from Genoa in Italy. He was part of the massive push by world explorers to discover unknown regions. Columbus's real skills lay in mapmaking and marine navigation. Check out these awesome free printable medieval navigation tools like the ones Columbus would have used. Experiment with the sextant, astrolabe, kamal, cross-staff and quadrant. Bear in mind, these tools were the keys to unlocking the secrets of the unknown world. Many world explorers were looking for a new trade route to the West Indies. And the only way to get the spices, silk, opium and trade goods was to sail east. This was a long, hard trip and 99 percent died trying. So Columbus decided to do something new and (most agreed) crazy. 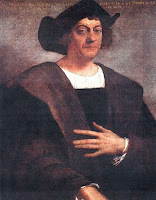 Ocean voyages also cost a lot of money, so Columbus needed a royal patron to sponsor the trip. But no one wanted to invest in his nutty scheme and he had a hard time convincing anyone to lend him the money. Finally, Columbus asked Queen Isabella I of Spain. That good lady wanted more land for her empire so even though everyone thought Columbus was wrong to sail west, the queen agreed to help. Columbus assembled three ships with crew and supplies. He named them Nina, Pinta and Santa Maria after the Blessed Virgin and Child Jesus. He hoped they would bless his journey. The three ships set sail from Palos, Spain on August 3, 1492. On October 11, Columbus got a major surprise when he bumped smack dab into a chunk of land he hadn't expected to be there. Where his navigation predicted the West Indies, was a previously unknown land which today is called the Bahamas. Still thinking he was somewhere in India, he decided this must be the East Indies. He called the native people "indios" or Indians. The myth persisted and the name stuck. That's why native American peoples are referred to and still refer to themselves sometimes as American Indians. But not finding the West Indies and finding this New World instead wasn't all bad for Columbus Part of the agreement with Queen Isabella was that Columbus would get 10% of everything he discovered. Imagine owning 10% of North, South and Central America?! Of course as the magnitude of his find reached European ears, his piece of the pie was drastically reduced. But Columbus was made governor of Hispaniola, the name for the New World. That was a better deal that most world explorers got! However some complained that Christopher Columbus was cruel to the local people whom he ruled. Columbus returned in chains to Spain and was put on trial. He was acquitted and allowed to return, but was not allowed to govern Hispaniola again. Christopher Columbus made four voyages in all. He died on May 20, 1506, believing he had found and should own "East India." The U.S. celebrates Columbus's voyages on October 12. For free printable Christopher Columbus lessons and world explorers, mapmaking and navigation activities, click the links in this article. For more free printable social studies lesson plans, including a whole unit on American history activities, scroll around this blog Free Printable Lesson Plans or Free Lesson Plans 4U.